Poor security at the Port of Incheon on Korea’s west coast has been blamed for allowing two foreignsailors to enter the country illegally in the past week. A Chinese sailor, 53, entered through Dongbang storage yard at the international harbor’s North Port at 9 a.m. on Oct. 22. Incheon Port Security said its personnel appear to have led the man through the port’s main entrance after thinking he was a Korean working at an unloading dock. On Oct. 28, a Vietnamese sailor, 24, slipped through port security. He arrived on the Belize-registered ship JIGUI three days before. The sailor made his move at Hyundai Steel Wharf at the North Port. Security cameras showed he “walked away” through the port’s main entrance. The city’s immigration office has started searching for the sailors. The Port of Incheon said it was investigating how the two could have left the port unchecked while security personnel were in position. “We are very perplexed over these repeated incidents as we had mentioned before about the importance of gate-keeping over foreign sailors,” a Port of Incheon official told Aju News. A day after the Vietnamese sailor left the port, Incheon Port Security’s union members protested in front of the National Assembly. They condemned the port and the Ministry of Oceans and Fisheries for changing shift schedules to reduce working hours without consulting workers and refusing to give several contract workers regular employment status. They claimed the issues had weakened immigration control inside the port. The Port of Incheon’s safety protocol states that a security check officer, a security camera monitoring officer and a patrol be present to guard the North Port’s main entrance, according to online media outlet Labor Today. When the two incidents happened, there were only two officers because of a workforce shortage. Workers at the Inner Port and terminals are regular employees or have permanent contracts. Those at outer ports, including North Port, South Port and New Port, are seasonal contract workers on lower wages than regular workers. The turnover of contract workers has fluctuated over the past couple of years. Since 2015, more than 100 workers have quit each year. The workers’ average employment duration is just eight months. This year, 133 were hired and 100 left. Fewer than 120 contract workers are deployed across the outer ports while there needs to be at least 144. There were shift changes for contract workers after the government mandated in July that weekly working hours be capped at 52. 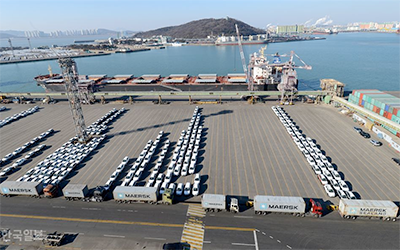 Incheon Port Security cut hours and wages andrefused the union’s request to add 23 workers to the Inner Port and 33 to outer ports, the union said. A union leader said the wage cut also hurt regular employees. He said workers’ morale “hit rock bottom” and “work shifts must be re-adjusted while irregular employees’ work security must be guaranteed” to empower security personnel at the port.